Valor Farm stallion Crossbow was represented by his first winner when Crossbow Huntress took the first race at Evangeline Downs Aug. 26. Juvenile first-time starter Will Call drew off in the stretch of his maiden special weight debut Sept. 28 at Indiana Grand Racing & Casino to become the first winner for freshman sire Country Day. Reverend John became the first winner for his sire Noble's Promise in a one-mile maiden special weight for Indiana-breds at Indiana Grand Racing & Casino Oct. 12. Ohio freshman sire Alcindor , who already had two black-type runners in his limited first crop, finally got his first winner when True Cinder won by 12 lengths at Mahoning Valley Race Course Nov. 14. Angiolo (ARG) is by Grand Reward, out of Wait (ARG), by Southern Halo. He is a multiple graded stakes winner in Argentina, with his biggest win coming in the 2011 G1 Gran Premio Santiago Luro (1200m). He has 55 foals in his first crop. Freshman sire watch is on! The durable runner Flat Out recorded his first winner from his first starter, as Flat Drunk rallied to prevail in her career debut at Keeneland. The filly, bred and co-owned by Bryan and Gray Lyster, is out of the Lion Heart mare Feline Flatline. Flat Out, standing at Spendthrift Farm, won or placed in 17 stakes and bankrolled more than $3.6 million while racing from ages 2 to 6. He won two editions of the Jockey Club Gold Cup and finished third in another, captured two editions of the Suburban Handicap, and finished third in the Breeders' Cup Classic. He also showed the miler ability that can be the hallmark of a good stallion, winning the Cigar Mile and finishing third in the Met Mile. Other career highlights included runner-up efforts in two editions of the Woodward, a second and a third in two editions of the Whitney Handicap, and a third in the Clark Handicap. Data Link gets his first winner with his first starter. Claiborne Farm's Data Link got a quick start to his freshman year when his first starter Di Maria became his first winner in her debut April 19 at Gulfstream Park. Awesome Patriot has his first winner with the filly Amberspatriot. Spendthrift Farm's freshman sire Awesome Patriot got his first winner April 19 at Keeneland, where Amberspatriot won a $60,000 maiden special weight going 4 1/2 furlongs by a length over males. 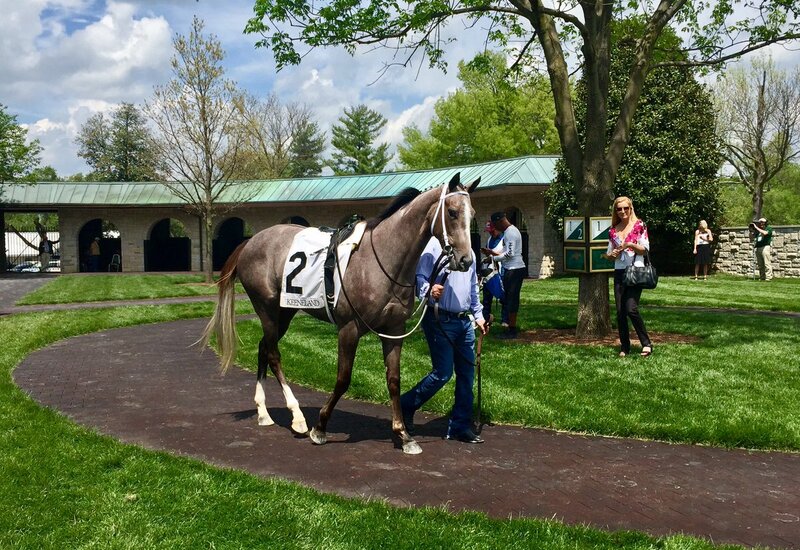 The juvenile filly out of the winning Limehouse daughter Starkey was bred in Kentucky by Jim and Pam Robinson's Brandywine Farm and was offered through the 2016 Keeneland September yearling sale, where she was bought back for $1,300. Starkey has now produced two winners from as many starters. Her first foal is Midway Playa, a 3-year-old colt by American Lion. ANALYZE THE ODDS (c, 2, Overanalyze–The Sense Angel, by Mineshaft) took all the money as part of a Repole Stable/Todd Pletcher entry and rolled to a professional first-out victory at Aqueduct. Sunny Skies just won the 1st at Keeneland, a 4 1/2-furlong MSW full of nicely-bred fillies. TVG said she is the first winner for Animal Kingdom, although I wonder if he has had a winner already in Australia, where he stood first before coming back to the US. Sunny Skies looks like she could be something special, as the lovely chestnut opened up in the stretch to win by what looked like double-digits...and she did it with no urging and with her ears pricked the whole way. BaroqueAgain1 wrote: Sunny Skies just won the 1st at Keeneland, a 4 1/2-furlong MSW full of nicely-bred fillies. TVG said she is the first winner for Animal Kingdom, although I wonder if he has had a winner already in Australia, where he stood first before coming back to the US. Animal Kingdom has 3 winners so far in Australia. Sunny Skies is his first northern hemisphere runner and winner. Holy smokes that was a fabulous debut. Really have liked what AK has been throwing. Types that look like any kind. That kind of debut (on dirt, no less) makes you dream if you have an AK in the barn. Thanks for the info, which doesn't surprise me. IMHO, AK is going to be a very good sire, and I can't wait to see how his next US crop does. I believe that many new sires are bred to speedy mares, in order to acquire good stats with precocious runners. If that goes well, the second or third season will see the 'stout' mares brought in, and that crop could hold the best chances for classic winners. Wow, I'm over the moon to hear that about Animal Kingdom, I'm really rooting for him as a sire and think he could be a fantastic asset both in North America and the Southern Hemisphere. He's got such an interesting pedigree. I imagine a replay for Sunny Skies's debut will be up on the Keeneland website? Ashford Stud's freshman sire Declaration of War was represented by his first winner May 8 at Royal Windsor Racecourse when Declarationoflove took the British Stallion Studs EBF Novice Stakes by 1 1/4 lengths. Claiborne Farm's freshmen sire Orb had his first winner June 11 when Earth won his debut at Gulfstream Park. Eclipse Thoroughbred Partners' Earth ran down frontrunner Pocket Book to get his neck in front in the five-furlong maiden special weight turf race for 2-year-olds.